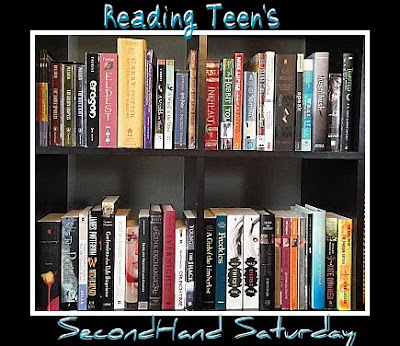 Google+ Reading Teen: Second Hand Saturday! 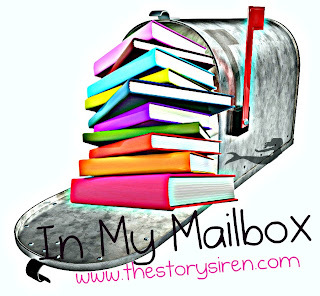 A Book-A-Week Giveaway! Second Hand Saturday! A Book-A-Week Giveaway! We decided that since we do Second Hand Saturday every week, and we've started doing In My Mailbox, that we would try out combining the two. If you're only here for IMM, feel free to skip the giveaway, and just watch the video. 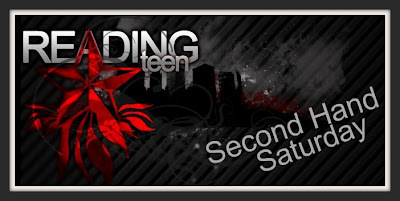 If you're here for Second Hand Saturday, answer this in the comments: As I post Secondhand Saturday this week, I'm listening to crooner music (Frank Sinatra, Dean Martin, Harry Connick Jr.) just singing along... what kind of music do you listen to while you are hard at work? Extra entries in the form. We are sorry, but since Andye has been on vacation for the last two weeks we will just let you enjoy our last IMM for the second time around. Yes, we know you want to watch it again... ENJOY! strings attached looks awesome. thats on my "to read" list. I think its great you actually monitor what your kids are reading... kudos. I prefer to sing myself when I'm working, as listening to music usually distracts me. When we clean the house, we love listening to anything with a good beat, especially with a latin one. We love us some Carlos Santana!! I love listening to soft music like Three Wishes by The Pierces when I study. When I study, I need absolute quite or else I will get distracted and start singing or humming with the song. Depending on what the work is and my mood, I switch around. If I need pepping up for an assignment, or it's an important assignment, I usually listen to rock music, whereas if I'm pretty in the mood to work, I'll stick on something soft, like instrumental stuff or the like. When hard at work, I like to listen to anything peppy. Lately, I've been playing Train's Save Me San Fancisco a lot. Looking forward to the "Strings Attached" review. I read Blundell's "What I Saw and How I Lied", and really enjoy it. So, I've been curious about her newest novel. I listen to the radio that has pop songs when I study or working. My favorite lately is Adele's songs. Are you to lazy to do one by yourself? ;) LOL Here's my mailbox. I have started to listen to Imogen Heap's old songs. My favorite songs are from Globus. They are not just one singer, they have differnt people sometimes. Their songs are different too because some have words and others are like musical soundtracks. I listen to music without words, like classical music or soundtrack music. Music with words tend to distract me when I am focusing on a task. For me, it depends on what I am doing. If I am doing something that requires concentration, I need peace and quiet. If I am doing chores around the house, I listen to music. I like to listen to old bands like the Journey. If anything--and this is when I'm desperate--I listen to anything that comes up when I type "music for concentration" into YouTube. =P As much as I'd like to have a work soundtrack, I'm just not at my best when distracted by sound. No need to enter me. =) I just wanted to answer the question. I really like to sing when I'm working, like doing house chores. But when I'm studying I usually listen musics by my favourite artists, 30 Seconds to Mars and The Gazette. I'm participating in the hope of winning Becca Fitzpatrick's Crescendo. I loved the first book and I'd really like to own the sequel too. I also twitted and facebooked. I've wanted to read Darkest Mercy by Melissa since it's come out. I love her series! When I am hard at work, I tend to listen to my favorites such as Lenka, Florence and the Machines, Girl Named Toby, and Birdy. They have the greatest songs. I actually listen to rock... Haha And sing! Amazingly, it doesn't distract me... Well, hurray! I started to watch the Vampire Diaries and I noticed that they have a lot of good songs. So most of the songs that I listen to are from the CW network shows. They are like pop and rock songs. OMG! I am drooling over the selection of books we can choose from. That's awesome that you guys oversee what your kids are reading, when I was younger my mom and dad did the same thing. Whenever we are working at my house my stepfather would usually play his oldies which I didn't like at first but it's sort of grown on me. When they aren't in the house and I am working I usually turn on Pandora and listen to the Paramore channel which plays their songs and a bunch of other bands that sound close to their music. Cut, Crop, and Die. Thanks for the giveaways. I love your IMMs. My music now is Celtic Thunder and Gaelic Storm.